Best Student Paper Award of the Sixth International Workshop on Content-Based Multimedia Indexing (CBMI 2008) This work presents an evaluation in terms of object representation of the hierarchical region-based representations created by a family of general statistical region merging algorithms. These merging techniques are based on different versions of information theory statistical measures; concretely, the Kullback-Leibler divergence and the Bhattacharyya coefficient. Additionally, a significance index can be defined together with these techniques to extract the most statistically meaningful partitions at different levels of resolution. The first part of this object-based analysis evaluates the ability of the hierarchy of partitions created by each method to represent the objects in the image. 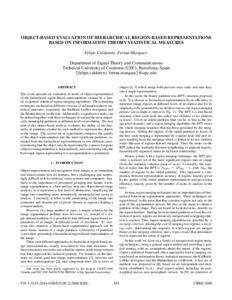 The second set of experiments compares the quality of the object representation into the most significant partitions extracted from the hierarchical representations in two different cases: considering that the object may be represented by a union of regions (object oversegmentation is not penalized), and considering only the best single region representing it (oversegmentation is penalized). Calderero, F.; Marques, F. Object-based evaluation of hierarchical region-based representations based on information theory statistical measures. A: International Workshop on Content-Based Multimedia Indexing. "2008 International Workshop on Content-Based Multimedia Indexing: CBMI 2008: Conference proceedings". Londres: IEEE Computer Society Publications, 2008, p. 184-191.